Teach English in Colombia, includes On-line TEFL certificate, round-trip air-ticket, $2,000,000 COP monthly salary. Choose from 6 - 12 month program with option to continue teaching in Peru, Uruguay and Argentina. Explore South America! Experience life in one of South America's most vibrant destinations! major urban cities including Bogotá, Cali, Cartagena, Cúcuta. in one of the most sought-after destinations for TEFL teachers. who study at community-orientated schools. Average class size is 10 students! An advisor will contact you with further information. Quickly becoming one of the most sought-after destinations for TEFL teachers, Colombia has every South American wonder imaginable. From beautiful coastlines skirted by the Caribbean Sea, to hillsides full of some of the best coffee plantations in the world, teaching English in Colombia is a truly life-changing experience! As the largest economy in South America, Colombia is both modern and traditional, perfect for those who want to experience the authentic South American lifestyle in well-developed cities and towns. Are you ready for one of South America's most spectacular destinations? 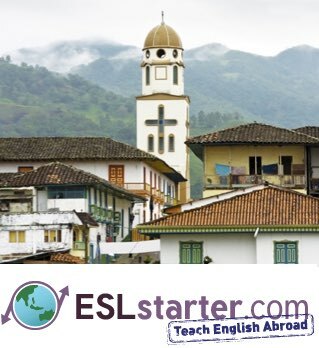 Teach in Colombia - Apply Now!